The plan is working. Day one I did do a little more than intended, but with great weather and an opportunity to meet up with one of my athletes, I couldn’t resist; day two compensated as I did a little bit less than planned, my legs were feeling the previous extra effort; today I’m sticking to the plan as it’s only a short session. The flexibility is there and I know not to race ahead of schedule, the urge to cram in more is under control. A good start, but I’ll save declarations of success for three months down the line, rather than three days. 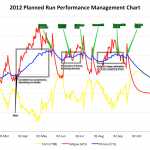 On Wednesday I planned a year of running in the form of a Performance Management Chart (PMC). 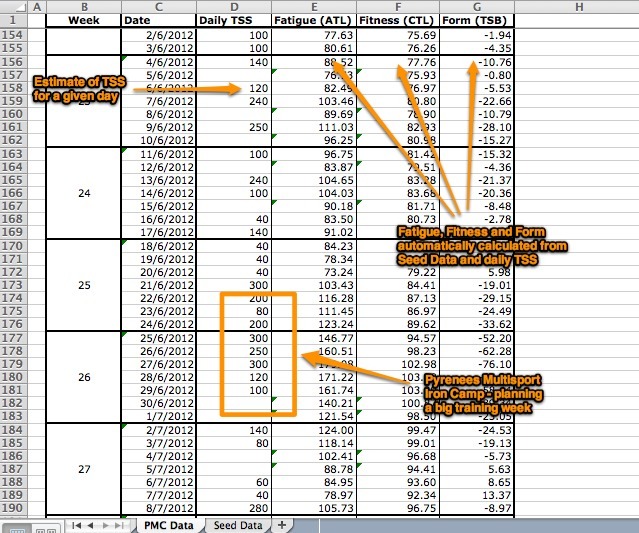 By managing my weekly training schedule to replicate this intended growth in fitness I should avoid many of the pitfalls from previous seasons without being tied to a rigid timetable. Obviously I also need a plan for cycling (and I should do one for swimming too), so on a clean copy of the spreadsheet I repeated the process. For those interested in trying this, or in seeing how their current plans line up, I’m going to walk through how I plan with the PMC and have provided a copy of the spreadsheet at the end of this blog. Everything hinges around Training Stress Scores (TSS), the PMC is built on these after all. 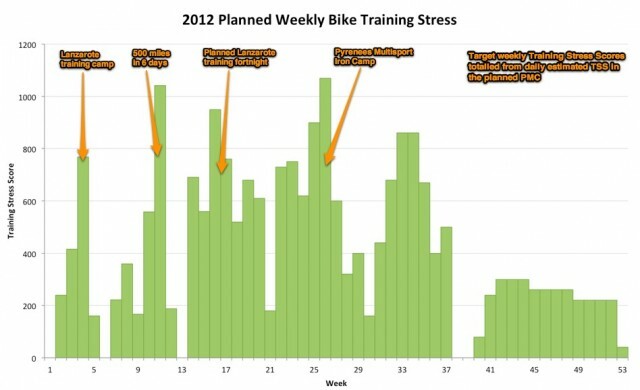 Every workout can be assigned a Training Stress Score, it’s calculated from intensity and duration of the session, the longer or harder you train the higher the TSS. Software like Training Peaks can do this automatically from uploaded data files, it weighs the relative intensity of every second to produce a figure. Different workouts will have different TSS and you can achieve the same TSS in many different ways; it is simply a value that attempts to give some indication of the impact of training. So to plan ahead with the PMC we need to estimate the TSS of every session we intend to do. I’ve developed a sense for the kind of TSS a session will score. There are no set rules and it takes time and experience to develop a good impression of the scores you will likely produce. 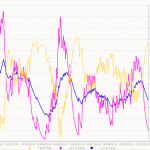 Some sessions are harder to estimate than others – intervals alternate between the high scoring work and the low scoring recovery, add enough hills into a long ride and similar variability can be there. However experienced you are with the PMC this is not a precise art, but the approach to planning I’m describing here is not intended to be precise. If you download the spreadsheet the first thing you will need to do is set up some seed data for the PMC algorithm; you’ll find the ‘Seed Data’ sheet at the far end. There are three values in particular we are concerned with – a start date, a starting ATL (fatigue) and a starting CTL (fitness). You can pick any start date you like, the spreadsheet plans for 53 weeks from that date. Dates are only specified to help build the plans from a calendar. The starting ATL and CTL values are a little more complex, for those already using the PMC, set them to the respective values from the day before your plan’s start date. Those who have never used a PMC (and have decided to play with this) should read this information on getting started to help choose values appropriate values that reflect their level of training. Now our estimation skills come into play. For each day on the PMC Data table we can enter a TSS value to represent the training we intend to do, this value will feed into the algorithm and predict fitness and fatigue. 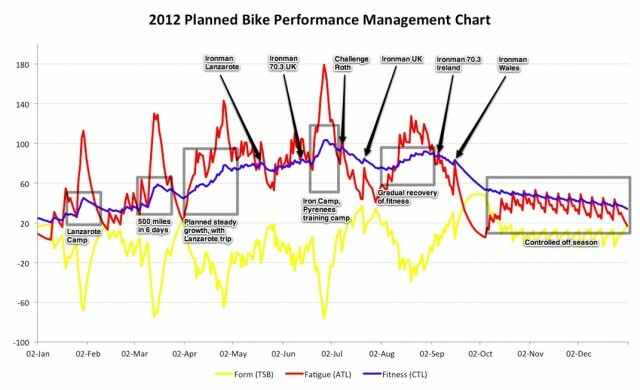 I’ve shown my plans for the period around Ironman 70.3 UK and leading the Pyrenees Multisport Iron Camp at the end of June. As the camp itinerary shows there will be a lot of hard riding over the week, so I’m expecting high duration and moderate to high intensity which means some high TSS. From my table of estimates I’d anticipate sitting in the 50 – 70 TSS per hour region, high for me on long days of cycling. Working around known events and with a rough idea of the sort of sessions I’m likely to do I can fill out the entire table; hard days and long days scoring higher TSS than easier days, and rest days scoring none – allocate these out and a chart develops. Once again a plan of action in the form of a chart. Reviewing the chart allows me to refine the plan, eliminating periods of overly rapid growth, preventing TSB (form) dipping too low and ensuring I don’t go fallow for too long. As with the run plan I take lessons from the past, while I’ve sustained higher fitness before, doing so often came at a cost and the time involved is incompatible with the run plan. By avoiding rapid spikes in fitness and following a gradual path to greater fitness I should be more consistent across the season. 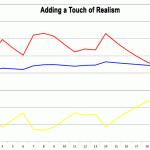 It’s a realistic approach that fits with my available time. One final chart from the data – total weekly TSS from the plan. Summing the estimated TSS for each week gives an easier figure to follow and target as I attempt to put this PMC into action. It allows me greater freedom within the week, so if my high TSS long ride was scheduled for a Monday, but a Tuesday works better I can just change it; within reason as long as I target weekly TSS I should be on track with my PMC. 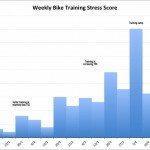 So I have plans now and it does seem targeting a weekly Training Stress Score incentivises me, at least so far. For those unfamiliar with the Performance Management Chart this may seem an abstract and convoluted way to work, but on a personal level it fits my needs; for those who use the PMC and haven’t attempted to plan with it before, it can be a useful tool, providing a simple sanity check on your training. At the end of the day it’s just another way to approach planning training. If you want to build your own Performance Management Chart you can download an excel copy of the PMC Planner.